NuCalm Relaxation - Dr. Isaac Comfortes, D.D.S. 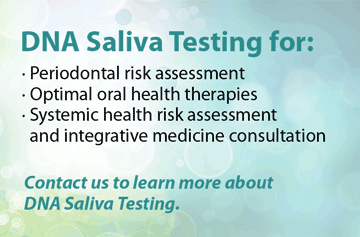 With your total health in mind, we want to reduce the stress of dental visits and offer a way to relax and rid yourself of any anxiety you have brought with you to your appointment. 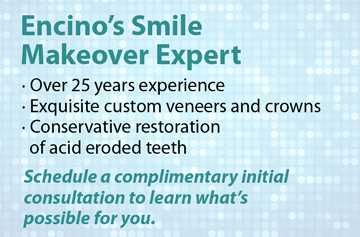 What we offer to our Encino dental patients is unique in that it is nonnarcotic and fully natural. 1. Rub a bit of cream on your neck on each carotid artery that allows a nonnarcotic relaxation supplement to enter your blood stream and reduce the effects of adrenaline. 2. Place microcurrent stimulation patches behind your ears. The mild electrical impulses will reduce muscular tension in your neck, shoulders, and upper back. This physical relaxation can last for several days after your appointment. 3. Give you special headphones to wear that will play soft, anxiety-reducing music during your appointment. This music is specially chosen and formatted with proprietary software to affect your brain waves and induce deep relaxation. 4. Offer you an eye mask to wear during the appointment. If the sight of a dental operatory and dental tools triggers anxiety for you, you will appreciate this added means to help you relax. NuCalm™ will reduce physical and mental anxiety, putting your body in the alpha stage of sleep. You typically reach this stage right before you fall asleep every night. It is characterized by physical relaxation, deep breathing, drifting thoughts, and a floating feeling. Alpha sleep is quite pleasant, and you will still be able to respond to the dentist, dental assistant or hygienist during your appointment, and time will pass quickly. Many patients liken their experience with NuCalm™ to a spa visit. All-natural: NuCalm™ redirects your body’s own impulses, inducing a natural state of relaxation. After treatment, you will be fully alert, able to drive yourself home, and ready for the rest of the day’s activities. Fast acting: NuCalm™ takes effect in 3 to 5 minutes. Retrains your body’s reaction to stress: NuCalm™ does not simply override your body’s reaction to stress. It retrains it, making your muscles more relaxed. After several visits with NuCalm™, you may find that you no longer feel anxious when you think about visiting the dentist. NuCalm™ was developed in 2002. Since that time, the treatment has rapidly changed the way that dentists treat anxious patients. NuCalm™ has been featured on ABC, CBS, NBC, Fox, and WGN Chicago. Perhaps more significantly, over 250,000 US patients have undergone treatment with NuCalm™, and 98% of these patients say they would recommend it to friends and family who want to receive relaxing dental care. Receive the stress-free treatment you deserve. At Total Health Dentistry of Encino, we see some patients who have suffered from dental phobia for years, and we see many patients who are anxious about certain dental procedures. In all cases where NuCalm is tried, the relaxation results have been wonderful. Please, do not neglect your dental health and put your systemic health at risk from oral pathogens and chronic gum inflammation. 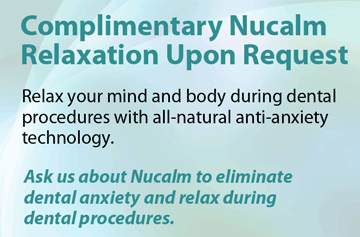 If you have any amount of dental anxiety, or if you desire a spa-like session of destressing while you are with us, NuCalm™ may be the solution. Patients who have tried NuCalm before, often request it, even if they do not feel anxious about their appointment. It gives their brain a mini-spa treatment so they are able to return to their busy day more energized and focused. 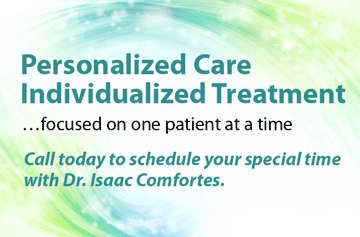 We welcome you to contact our office today and get started on the dental exam and treatment you may need with Dr. Isaac Comfortes, one of the nation’s most experienced and compassionate dentists. “I actually feel better about being here!